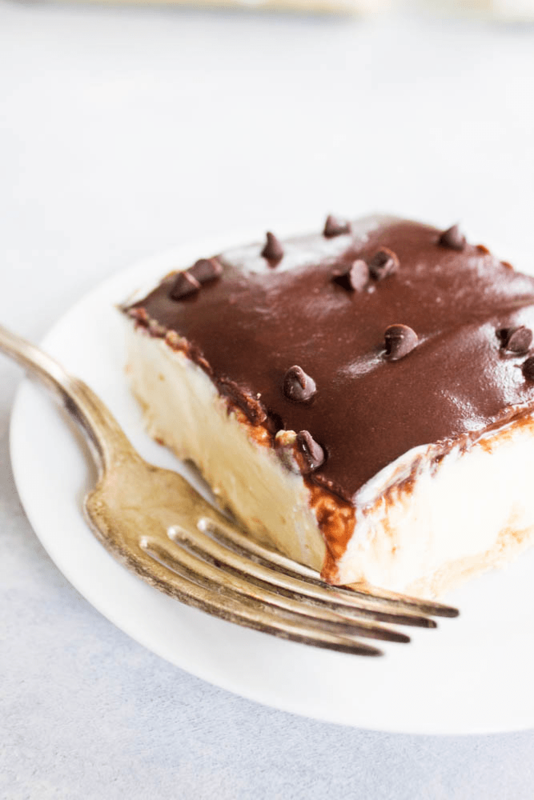 NO BAKE BOSTON CREAM PIE CHEESECAKE – where two classics collide into an easy and insanely delicious dessert that requires no baking! This post is sponsored by Family Dollar. All opinions are my own. 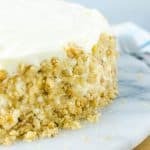 I am all about easy desserts, especially during spring time, when there seems to be as many barbecues and get togethers as there are newly sprung flowers. 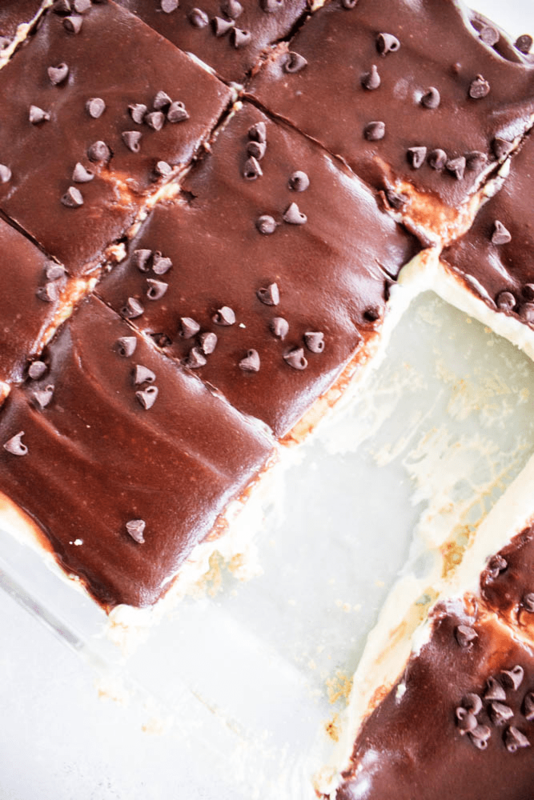 And this recipe for NO BAKE BOSTON CREAM PIE CHEESECAKE is a spring-inspired dessert that all of your guests will be drooling over. 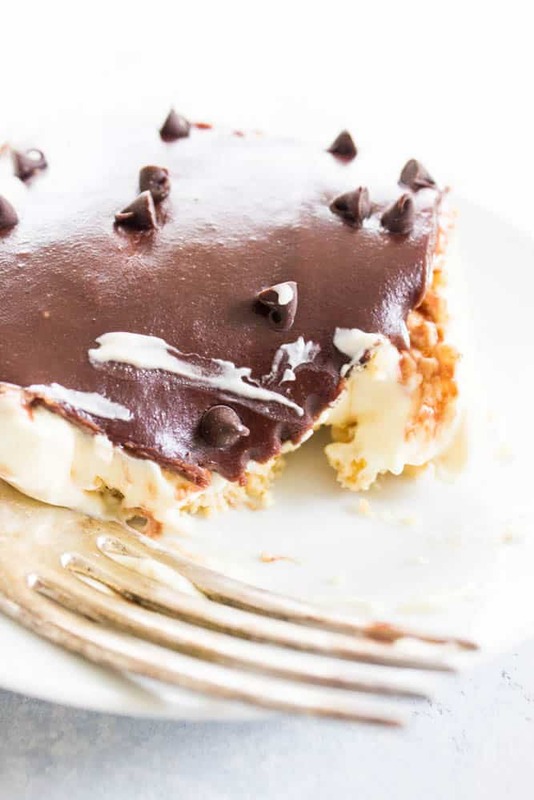 I love Boston Cream Pie; the chocolate topping and cream filling is a lethal combination to my diet, but worth every bite. I really wanted to make the pie for some friends I was taking dinner to, but I just didn’t have time. However, I did have time for a no bake cheesecake. No bake cheesecakes are my to go to dessert because I love that I can make it within a matter of 10 to 15 minutes and then sit back while it chills in the fridge. Simple and delicious, no bake cheesecakes are always a crowd pleaser. So that’s when I was inspired to come up with this awesome NO BAKE BOSTON CREAM PIE CHEESECAKE! And it came out just as delicious as I had envisioned. Instead of doing the traditional graham cracker crust, I went with some vanilla sandwich cookies I bought at Family Dollar. It was nice because I got all of my ingredients from there: the cookies, cream cheese, whipped topping, butter, chocolate chips and milk! Easy shopping trip + easy desserts = one happy mom! I like that in addition to picking up all of my ingredients there, I could get another essential for delivering the rest of the dinner to our friends too. This includes paper plates, because who wants to do dishes when you are getting a meal from a friend. I try to make sure there isn’t a thing they need to do or worry about when I take people dinner. Family Dollar is a great place I found to pick up everyday essentials for spring get-togethers. What I love about Family Dollar is the value I receive as a customer for my money and their Everyday Low Prices make me one happy shopper. The assortment they have available is always a plus as well as the convenience. 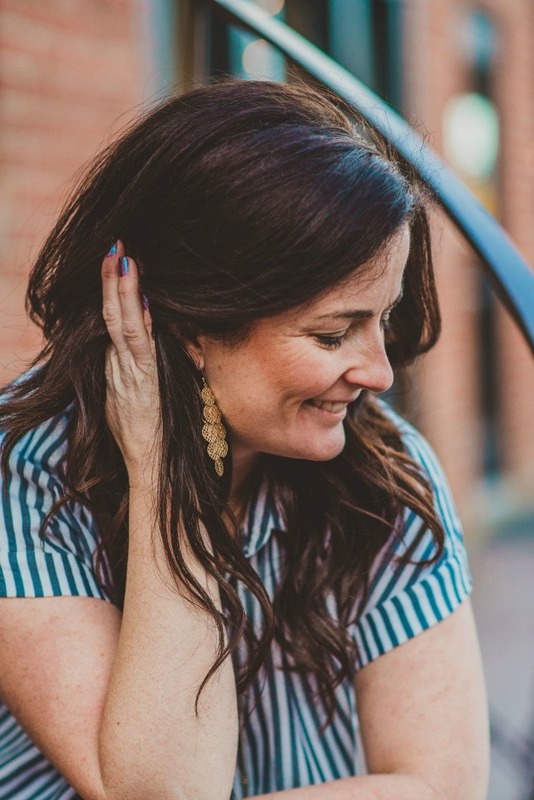 It is something every mom is looking for. Boston Cream Pie Cheesecake is one of the most amazing desserts I’ve ever had right here in Denver. While this recipe version of no bake cheesecake isn’t as decadent, that’s exactly what I love most about it. It’s creamy, yet not overly heavy. Some would argue the cookie sandwich crust is the best part. An additional benefit of this no bake version of the Boston Cream Pie Cheesecake is that it feeds a crowd. Using a 9×13 pan, you can serve this as 12 slices or 24 – or two if you’re my husband. If you are taking this NO BAKE BOSTON CREAM PIE CHEESECAKE to a party, make sure to grab a tin foil pan and take it in that. That way, you can leave whenever you want, and the dessert can still stay, assuming it lasts more than 10 minutes. 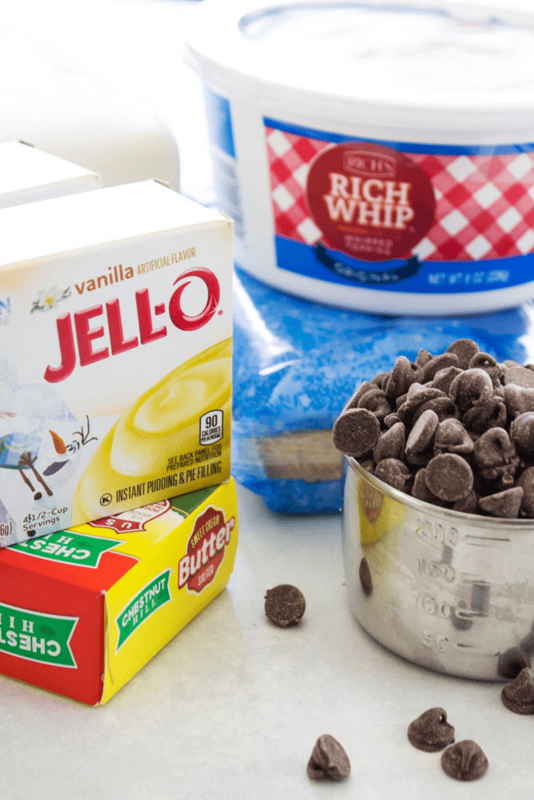 Here are a few tips on making the perfect no bake cheesecake. Make sure your cream cheese is at room temperature, so that it creams easily. 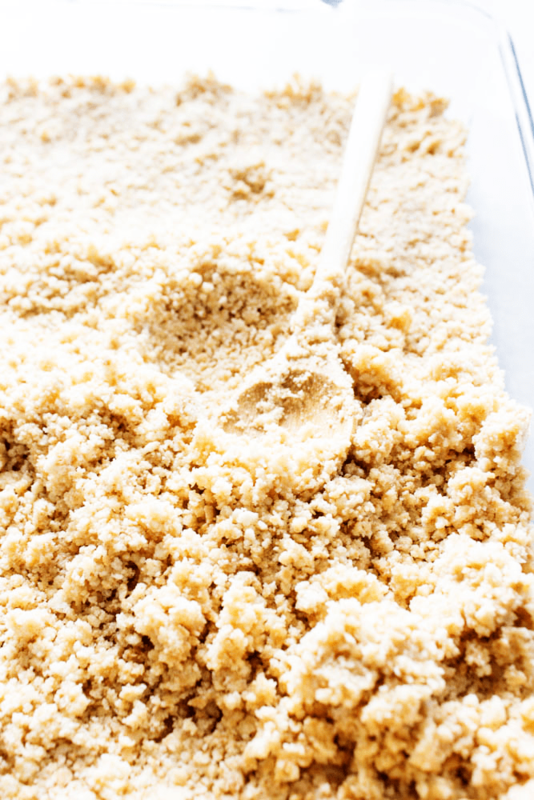 Use the bottom of a measuring cup to press the crust mixture into the bottom of the pan. Melt the butter completely to bind the cookie crust. Allow the cheesecake to chill in the fridge 3-4 hours or more. Looking for an easy dessert that doesn’t take much time to create but makes you look like a star? 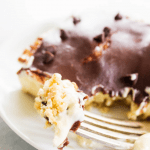 Try this NO BAKE BOSTON CREAM PIE CHEESECAKE. No bake vs. bake cheesecake? Baked cheesecakes are usually heavier, creamier, and more velvety. No-bake cheesecakes are lighter and airier. How do you make Boston Cream Pie Cheesecake? To make the cheesecake, whip the cream cheese in a large bowl, until light and smooth. Add milk and pudding mix and beat until well combined. To make the crust, melt butter and set aside. In a large Ziplock bag add vanilla sandwich cookies and crush until they resemble coarse crumbs. Add in butter and mix together. Add crust to 9×13 baking dish and press on the bottom of the pan. Add cheesecake on top and spread until smooth. In a small saucepan, add chocolate chips, butter, sugar, milk, and heat over medium-low heat while constantly stirring until melted and smooth. If you are using the vanilla, add this in. Pour topping over chilled cheesecake. 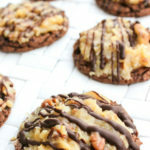 And top with chocolate chips if you desire. 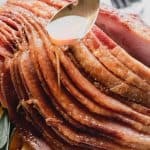 Place in the refrigerator for 3-4 hours. Don’t forget to pin this recipe for BOSTON CREAM PIE CHEESECAKE to your favorite Pinterest board for later. 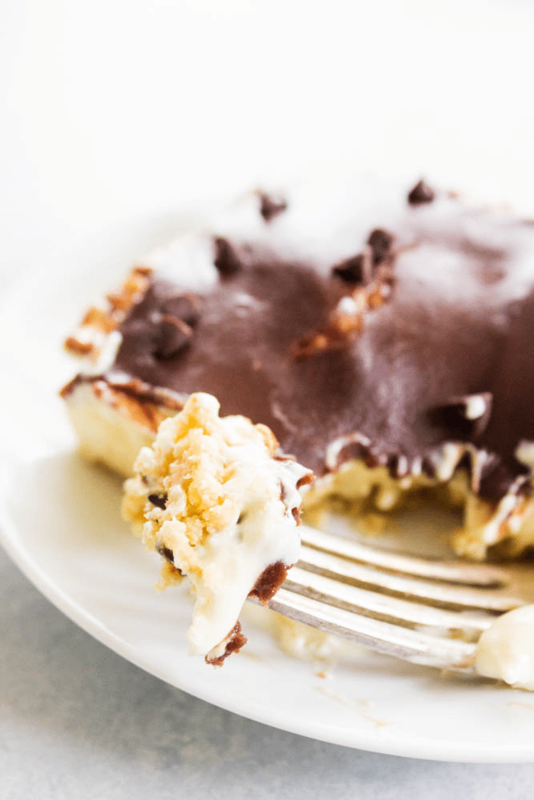 NO BAKE BOSTON CREAM PIE CHEESECAKE where two dessert classics collide into an easy and insanely delicious dessert that requires no baking! In a large whip the cream cheese until light and smooth. Add milk and pudding mix and beat until well combined. Gently fold in the prepared whipped cream or Cool Whip. Set aside. 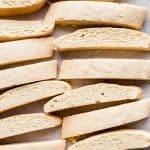 In a large Ziplock bag add vanilla sandwich cookies and crush until they resemble coarse crumbs. Add in butter and mix together. Add crust to 9x13 baking dish and press on the bottom of the pan. Use the tip above of using the bottom of a measuring cup. Add cheesecake on top and spread until smooth. Make chocolate topping. To a small saucepan, add chocolate chips, butter, sugar, milk, and heat over medium-low heat while constantly stirring until melted and smooth. Pour topping over chilled cheesecake. And top with chocolate chips if you desire. Place in the refrigerator for 3-4 hours. Chocolate Topping recipe from Averie Cooks. What a fun mash up of two classic! 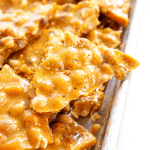 This is a must make for summer especially because it’s no bake! Yay!! It is perfect for summer. I hope you enjoy, thanks! Seriously how perfect does this look? Amazing! I’m seriously drooling over this!! 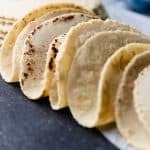 These look absolutely amazing. I can’t wait to try these out! This is my idea of the perfect dessert. Love it! 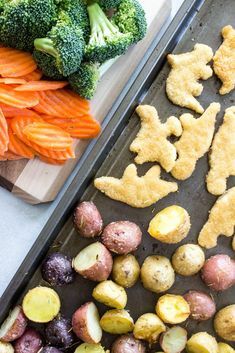 Oooh, that looks so yummy and I love how easy it is to make! 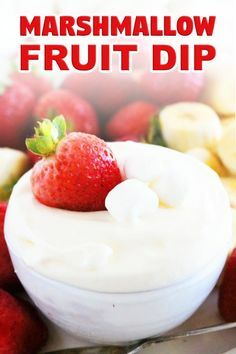 Love a good no bake dessert! I wish I had a slice of this cheesecake right now! We love Boston Cream Pie! I love no-bake recipes! Thank you so much! Gotta try this recipe soon! We use 3.4 ounce boxes of pudding. I’ll update the post to clear this up, thank you!